As Facebook gives the Israeli government more access to posts deemed as “incitement”, Israeli forces have been raiding the homes of Palestinians children and detaining them for months over posts on the social media site, a report by the Defence for Children International-Palestine (DCIP) said on October 17. The group spoke with several Palestinian minors who were arrested for their Facebook posts, interrogated for hours and held in jail for months without charges under the Israeli policy of “administrative detention”. A flotilla bound for Gaza carrying food, medicine and other humanitarian aid was intercepted and seized by the Israeli Navy on October 5. The Women’s Boat to Gaza had set sail from the Spanish port city of Barcelona in mid-September in an effort to break the ongoing Israeli blockade of Gaza, Democracy Now! said on October 12. During a August 17 European Champions League qualifying fixture in Glasgow against Israeli club, Hapoel Beer Sheva of Israel, fans of Glasgow's Celtic FC flew the Palestinian flag in solidarity with Palestine's struggle for freedom. The action came in defiance of UEFA threats to punish the club if fans flew the flag, and even Scottish police threats to arrest fans who flew the flag. Palestinians gather in the Gaza Strip for a rally against Israeli attacks on August 21. People in the Palestinian Gaza Strip said at least 30 Israeli airstrikes took place in the territory on August 21. The air strikes came after a rocket was fired earlier in the day from the territory into Israel, landing in an open area and injuring no one. Celtic fans defy a UEFA ban and police threats to fly the Palestinian flag during against against an Israeli team. During Glasgow-based football club Celtic FC's August 17 European Champions League qualifying fixture in Glasgow against Israeli club, Hapoel Beer Sheva of Israel, Celtic supporters defied an explicit UEFA ban to fly Palestinian flags in solidarity with Palestine's struggle for freedom. Israel is intensifying its efforts to crack down on activists working for freedom, justice and equality for Palestinians. On August 7, interior minister Aryeh Deri and public security minister Gilad Erdan formed a new inter-ministerial task force that will, as the The Times of Israel reported, “target supporters of the boycott, divestment and sanctions (BDS) movement”. The task force aims to prevent the entry of foreign activists allegedly affiliated with groups that support BDS. It also aims to expel those who have already entered territories under Israeli control. 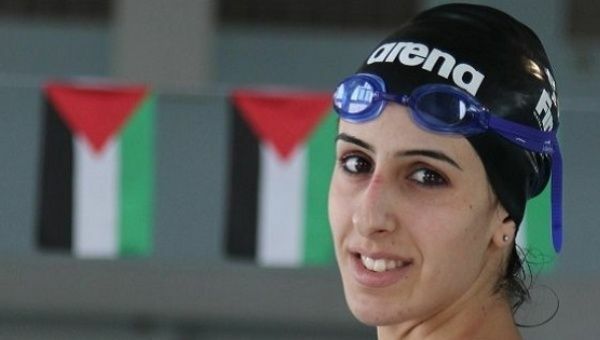 Palestinian swimmer Mary al-Atrash headed to the Rio 2016 Olympics despite the Israeli occupation making the West Bank-based athlete’s training extremely difficult. Hebron’s Ahly al-Khalil plays Gaza-based Shejaiya in the 2015 Palestine Cup. Ahly al-Khalil won the title, which it successfully defended on August 2 after Israel caved in to let players travel for the match.